Objective of technique: Several neo-adjuvant and adjuvant techniques has been described for advanced gastric cancer, including intraoperative hyperthermic chemoperfusion (IOHC). 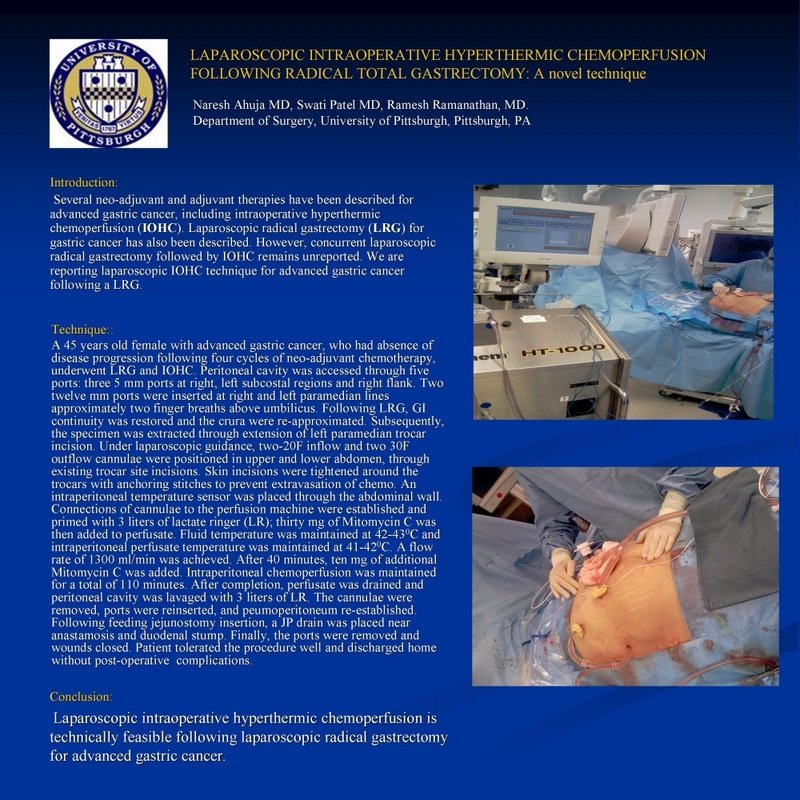 Laparoscopic radical gastrectomy (LRG) for gastric cancer has also been described, however, concurrent laparoscopic radical gastrectomy followed by IOHC remains unreported. We are reporting laparoscopic IOHC technique for advanced gastric cancer following a LRG. Technique: A 45 years old female, diagnosed with advanced gastric cancer, was found to have absence of disease progression following four cycles of neo-adjuvant therapy, was operated for LRG and IOHC. Peritoneal cavity was accessed through five ports: three 5 mm ports were entered at right, left subcostal regions and right flank. Two twelve mm ports were entered at right and left paramedian lines approximately two finger breaths above umbilicus. Following LRG, GI continuity was restored and the crura were re-approximated. Subsequently, the specimen was extracted through extension of left paramedian trocar incision. Under laparoscopic guidance, two-20F inflow and two 30F outflow cannulae were positioned in upper and lower abdomen, through existing trocar site incisions. Peri-cannulae skin incisions were tightened with cannulae anchoring stitches to prevent extravasation of chemo. An intraperitoneal temperature sensor was placed through the abdominal wall. Connections of cannulae to the perfusion machine were established and primed with 3 liters of lactate ringer (LR); thirty mg of Mitomycin C was then added to perfusate. Fluid temperature was maintained to 42-430C and intraperitoneal perfusate temperature was maintained at 41-420C. A flow rate of 1300 ml/min was achieved. After 40 minutes, ten mg of additional Mitomycin C was added. Intraperitoneal chemoperfusion was maintained for a total of 110 minutes. After completion, perfusate was drained and peritoneal cavity was lavaged with 3 liters of LR. The cannulae were removed, ports were reinserted, and peumoperitoneum re-established. Following feeding jejunostomy insertion, a JP drain was placed near anastamosis and duodenal stump. Finally, the ports were removed and wounds closed. Patient tolerated the procedure and discharged expectantly. Conclusion: Laparoscopic intraoperative hyperthermic chemoperfusion can be performed following laparoscopic radical gastrectomy for advanced gastric cancer.